I believe in social networking! As a career consultant I use social media tools to help job seekers by sharing blog posts and relevant news. What I’ve found over the past several years is that I’ve built real friendships with interesting people all over the country and all over the world. This has enriched my life and grown my network. I have developed mutually beneficial relationships with connections, followers and friends. I am never quite sure when, where or why we’ll need each other; however, I do value them all for different reasons: a future client referral, a potential guest blog post, a promising partnership, great thought-leadership and new ideas, or just for fun. I am in this game of networking for the long haul and I hope you think of it that way too. 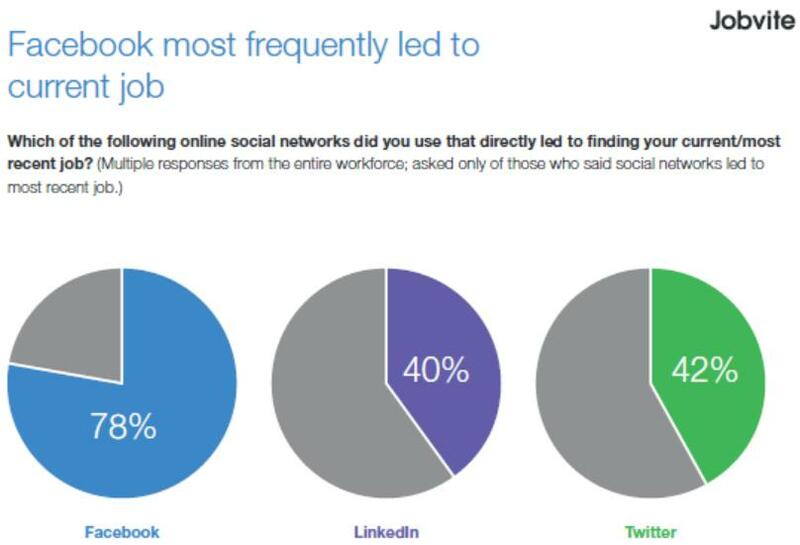 The follow story helps explain how social networks can help lead to a job. I loved this description of what they were looking for and I immediately posted it on a LinkedIn group for job seekers in our city. There were several people in this network who responded and at least one of the inquiries turned out to be the Goddess! 2. Because many job seekers aren’t active yet on Google Plus, I knew I had to share the opportunity where it would be found- a LinkedIn group of high caliber job seekers. 3. Most importantly, I knew the company, not well, but had been following them on Twitter for at least a year and we had shared information with each other previously. There was an existing familiarity and I was happy to help. I was also familiar with the group of job seekers, many of whom I had met. It was easy for me to post this description on the group and serve as the intermediary because I personally believed in these job seekers. Trust, familiarity, and willingness to help. This is why social networking works! My partner and I have a pretty unusual business, we create large-scale balloon installations and balloon-based illustrations (You really need to see for yourself: www.airigami.com) Business has been going very well- but as we’ve been growing- our need for someone else to help manage all of the details that come along with that growth was becoming more and more apparent. So we spent many an evening trying to craft the perfect description of our ideal candidate, what skills they might have, etc. And we could never seem to list them all- we jokingly said we needed to hire someone who’d know what they were supposed to be doing. When I first posted to your google+ page, in response to a discussion about hiring/job openings in Rochester, I rather cheekily said we needed a Goddess and listed a few super-powers. It was enough to intrigue a candidate to apply for the position. We hired her. She seems, (and her references glowingly agree) to be the sort of person you could put into any situation, and she’d find not only the most important things that needed to be done- but facilitate getting them done. This is EXACTLY what we need, and I’m glad we snatched her up! I am fairly certain, many smaller employers are perplexed and a bit overwhelmed by how to hire the right person. It is a daunting task and one they do not enter into lightly nor want to repeat. Social networking tools allow small and even large employers to tap into their networks and source candidates (for free). 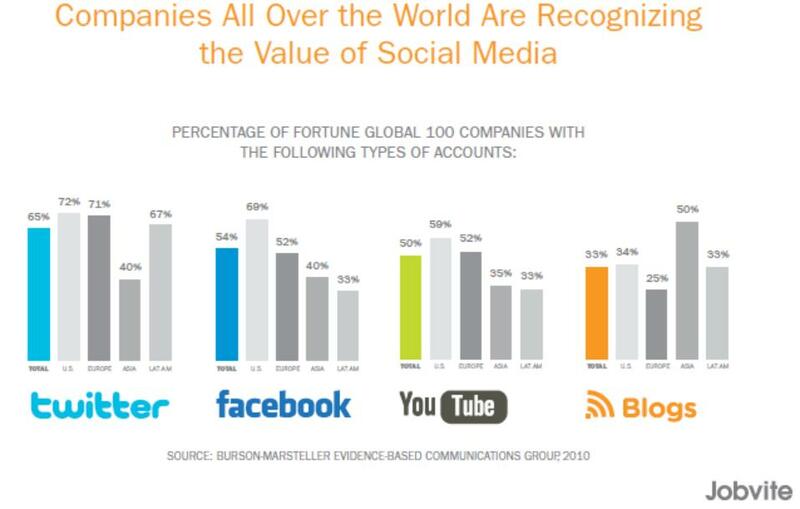 JobVite’s 2011 eBook “33 Essential Recruiting Stats“ cites a Burson-Marsteller study which shows the social networks being used by Fortune 100 companies. I hope this has helped convince you that using social networks to stay in contact with past employees, family members and all sorts of friends is more important than ever before- and there are tools to make it easy. There is so much more to be said about the benefits of social networks, but the point I am trying to make is “don’t miss out” by not participating! Hannah Morgan, aka @careersherpa on Twitter, provides advice and insights for job search, personal reputation management, and social media strategies via her site Career Sherpa.net. As a Career Consultant, Hannah draws upon her experience in Human Resources, Outplacement Services and Workforce Development to guide those new to job search through the process and towards their goals. Feel free to follow if you like what you see here. You can also find her on Google +, Facebook, and LinkedIn.